Okay, now that we’ve gotten that out of the way, let me formally welcome you to A Filipino Foodie blog! 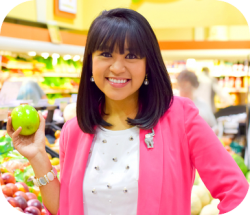 My name is Sheena Quizon Gregg, MS,RD,LD , and I currently work as a registered dietitian seeing all ranges of the age spectrum for one on one and group nutrition counseling. I received both my bachelors and masters in Human Nutrition and Hospitality Management from The University of Alabama (ROLL TIDE!). I’ve had the opportunity to complete the Commission on Dietetic Registration’s Certificates of Training in both Adult and Childhood/Adolescent Weight Management as well as participate in advanced training for body image and eating disorder issues. I have been a dietitian for over five years now but have loved food my whole life. Thanks for the follow. I really appreciate. Look forward to posts from your blog. Many thanks for the follow. I am a new blogger..Your support really motivates me. u have a nice blog!! Gonna be your follower too..
Hi ! I have nominated you for Liebester Award ! Congrats !!! You deserve this award ! Congrats to you Dear..
Aww, you are soo kind! Thank you! I am contacting you because recently, I’ve been considering nutrition as a possible career path, and I was hoping you might have some advice to give. I received a Bachelor’s Degree in History from UC Davis five years ago, and while I was there, I had the opportunity to take some introductory courses in Food Science and Winemaking, which stimulated an already present curiosity about cooking and the science behind it. Then, during my sophomore year, I discovered Michael Pollan’s “The Omnivore’s Dilemma”, and it transformed me from someone who merely appreciated good food and nutrition to one keenly interested in the culture, ethics, and politics of food and agriculture. Since then, I have become an avid home cook and baker and find myself using up most of my spare time either cooking or reading about food in some form or fashion. After I graduated, I flirted with the prospect of a career in education and spent some time tutoring high school students in history, writing, and SAT/ACT prep, but eventually decided that, while I enjoyed teaching, ultimately, I was drawn to the subject matter more than the act of teaching itself and so put that idea on hold. I picked up a part-time job at Williams-Sonoma (mostly for the 40% discount, since I probably spent more there than I made!) and then fell into an outside sales position at a Los Angeles based food distribution company, where I’ve been for the past year and a half. I am pretty sure now that I want my professional life to involve food in some way; however, I am not satisfied working in sales and distribution. It is too far removed from the actual process of cooking, and I do not feel that the environment facilitates intellectual growth or creativity. While I know I have a strong interest in nutrition and sharing my knowledge with others, I’m not entirely clear on what the day to day work of a dietitian entails, whether it be in a clinical setting or in private practice. I was hoping you might be able to share some of your own experiences in the field such as what a typical day is like and how your time is split up taking care of various tasks. I would also be interested in any suggestions you may have for other resources I could look to for advice or inspiration. I apologize for the long-windedness, but I figured the more information you had about where I’m coming from, the easier it would be to reply. Thank you!! Because I work so much with weight-management and nutrition, I constantly follow industry news. Recently I noticed your blog and I love your content. This past year we have started to improve our online presence and are focusing in on content marketing. I am looking for Link partners (Inbound links) and specialists who I can feature on our website for both Google authority (SEO) improvement and increasing business for both. Would you be interested to network and do link building (Off-page SEO) with us? If you want to just like us increase web-traffic/Google rankings, let me know!